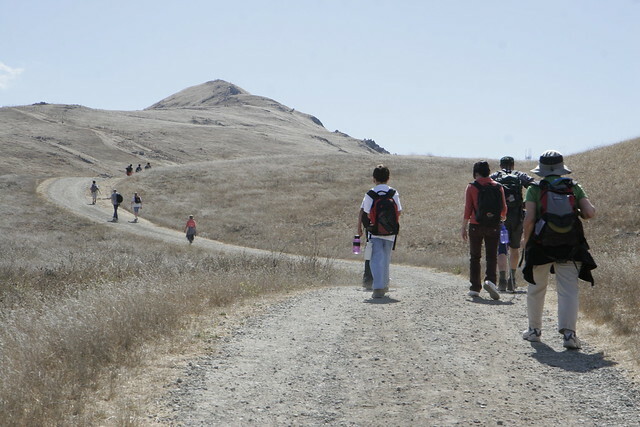 Eight Scouts and six adults had a great time hiking up Mission Peak on Saturday a couple of weeks ago. The weather was great, sunny but not hot, with clear views of our next peak to climb in the Rim of the Bay series, Mt. Diablo. One of our Assistant Senior Patrol Leaders was our leader and a new Scout, on his first outing with the troop, was our navigator, checking the map at each junction. 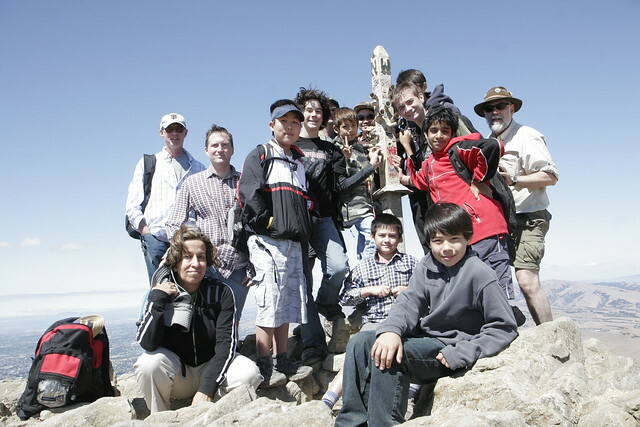 Two Scouts on this trip had hiked Mission Peak two years ago as their first outing with the troop. A tradition! We started up the trail at 9:18. The first section of the trail is almost as steep as the final climb to the peak, so we took two rest stops in the first hour. By 10:30, we were over that hump and stopped in the trees to snack and pull off our boots. No blisters! Out of the trees, we climbed up to a ridge with great views across the bay and a view of the peak ahead of us. After another rest stop and a tough hike up the last stretch, we reached the peak at exactly noon. We sat down, put on our windbreakers, and had lunch. The ASPL and I had a Scoutmaster Conference for his Eagle Palm. It set a personal record for the nicest location for a conference. We posed for a group photo, of course. I’m the one on the far right. If I look like I barely made it into the frame, it’s because I had ten seconds to get from behind the camera to on top of the rocks. The view was wonderful, from San Francisco down to San Jose, on the other side up to Mt. Diablo, and out to the Central Valley. We could see Del Valle Reservoir and the Ohlone Wilderness, where the troop will be taking a 20 mile backpack trip in the spring. To the south, the range of peaks continues, starting with Mt. Allison, which has a very impressive set of radio towers. After a half hour lunch break on the peak, we chose to come down the other side of Mission Peak and discovered that the trail is much easier on that side. We circled back around the peak past the Eagle Spring trail camp, four sites with a wonderful view out to Mt. Diablo. 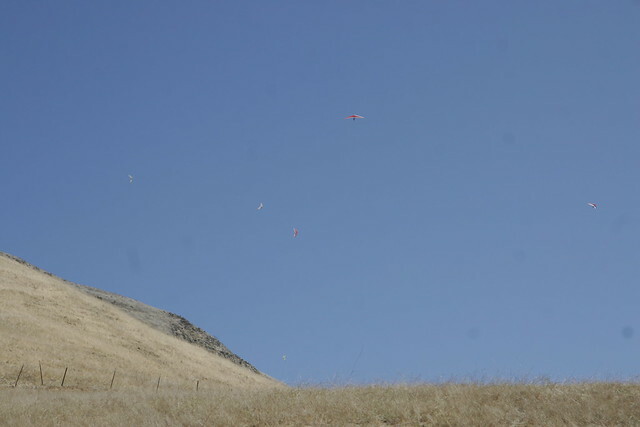 As we came down off the ridge, the hang gliding club started launching, so we could see them playing along the ridgeline. As we were almost back to the Ohlone College trailhead, we could see a grass fire burning close by in Fremont. We got back to the trailhead at 3:10, just under six hours on the trail. The hike leadership and navigation was great. It was clear that I was comfortable with the navigation, because I gave away both of my maps to two different people who asked me for directions. I was a bit sore for a few days, mostly because I’m still recovering from a bad ankle sprain, but it was a great hike and I’d do it again. 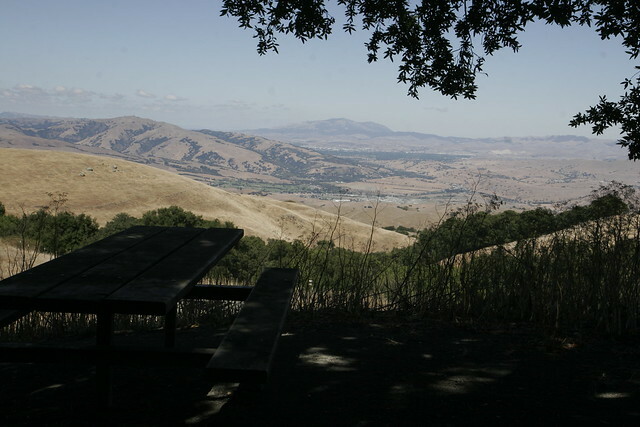 This entry was posted in Backpacking & Hiking, Scouts BSA and tagged Mission Peak. Bookmark the permalink.